What's on your C-Store Shopper's Mind? Weight Management. 89 percent of c-store shoppers currently participate in some type of loyalty/reward program across a variety of channels and categories, but only 35 percent of c-store shoppers participate in a convenience store or gas station loyalty program (General Mills). So, why aren't c-store shoppers joining their loyalty programs? First, there is a large gap in convenience stores that have a loyalty program. Then, there is the issue of satisfying the loyalty members of your program. In fact, only 35 percent of c-store/gas station loyalty members are satisfied with their current program (General Mills). 1. The bars are low-calorie. 2. They feel good about eating them. 3. They have a great taste. 4. The bars prevent them from overeating. 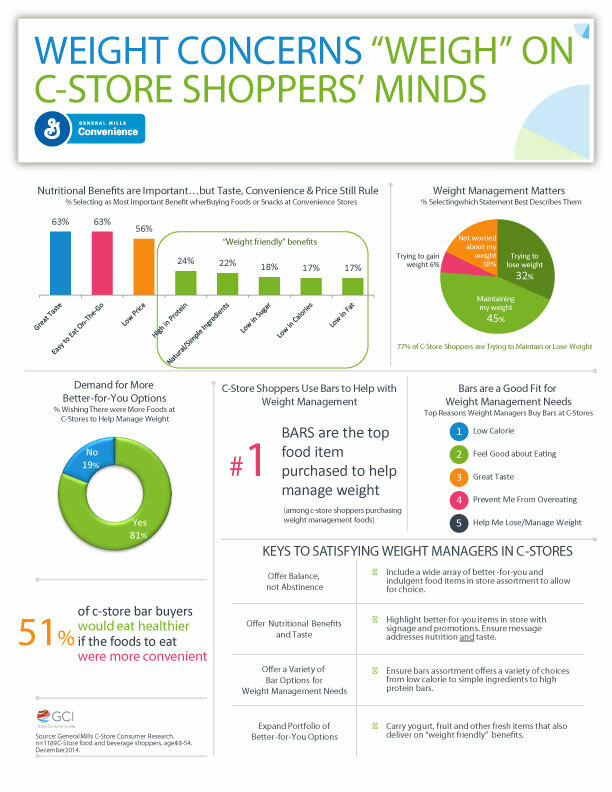 C-store shoppers obviously want healthier foods that help them achieve their weight loss and management goals. These bars also have to taste great, be affordable, and be easy to eat on-the-go. Bars are a great answer for these needs. Take this beyond bars by implementing these needs into your marketing strategy across your store. Highlight taste and weight-friendly benefits. You can implement this c-store marketing strategy into your loyalty marketing campaigns. Highlight healthier options in your emails and texts to your customers. Download our whitepaper including ten tips for customer rewards program success and start bringing your customers back in store today!